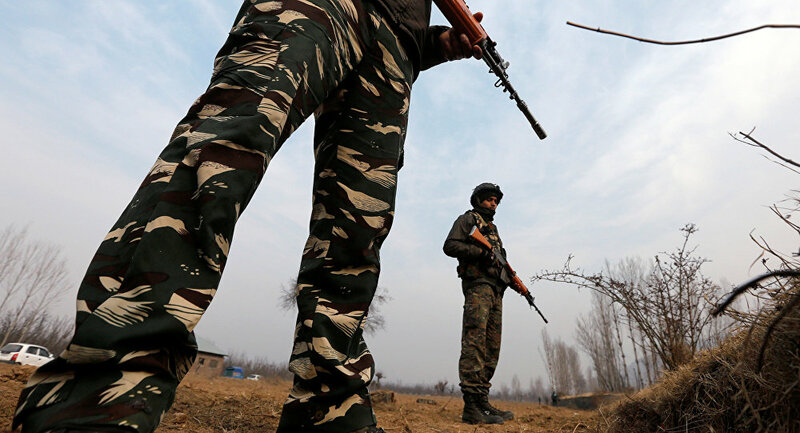 New Delhi (Sputnik): Militants have attacked an Indian armed police base in Tral, Pulwama district on Wednesday evening, Indian media reported. Official sources said that the 180th battalion of the Central Police Reserve Force (CRPF) was attacked with under barrel grenade launchers in the Nowdal area of Tral, resulting in injuries to one Indian soldier. The injured Indian soldier has been identified as Head Constable T L Parshad. "Unknown terrorists lobbed a UBGL grenade targeting camp. The grenade exploded inside the camp causing minor injuries to one Head Constable in fingers," a CRPF official told journalists. Security forces have cordoned off the area and also suspended data services. This is the same area where on Tuesday a grenade was launched at the residence of a local political leader. The 180th Battalion of the CRPF has been targeted on several occasions in the past by the terrorists.